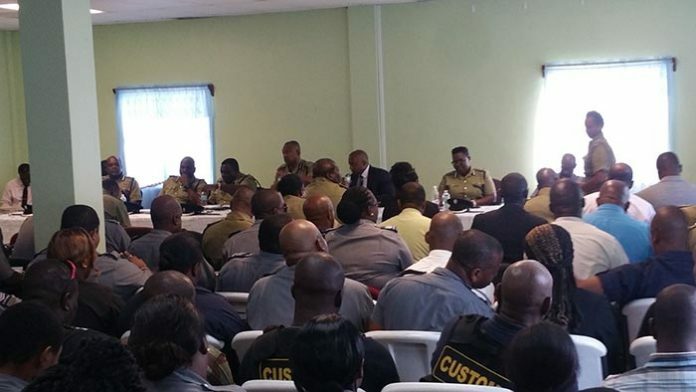 Commissioner of Police Ian Queeley has commended officers of the Royal St. Christopher and Nevis Police Force (RSCNPF) for the improvements they made in the fight against crime and lowering the murder rate in 2017 but encouraged further progresses in that area. Queeley stated, however, he believes that in order to successfully prevent crimes the police will have to be successful in detection. “I have always said that one of the best ways to prevention is detection and I can say to you that your detection rates that your detection rates has doubled in 2017 over 2016.” He disclosed that in 2016 the police had a detection rate of 19 percent among the homicides, while in 2017 they had a detection rate of 39 percent. Queeley indicated one area of concern is the amount of illegal firearms in the hands of illicit individuals despite the increases in the seizures by the police. Further addressing the homicides Queeley added that although there was a reduction to only 23 homicides that is still too many and hailed the officers for having prevented much more. He however, noted that the he aims to have a greater community presence from the police officers in 2018. “Something else I want to see in our year ahead is our community involvement. You would have realised that last year there were two community groups that were rolled out… I told the Permanent Secretary that I believe that the police should have a presence in all the police districts in terms of youth groups. The Commissioner informed the officers that 2018 will provide opportunities for promotions. “There are some vacancies that exist and very shortly the process to fill them will commence. We intend to take promotions in line with the policies that are laid out.” He then implored the officers to continue to improve on their efforts in 2017.